Most people would not question the species status of the polar bear (Ursus maritimus). 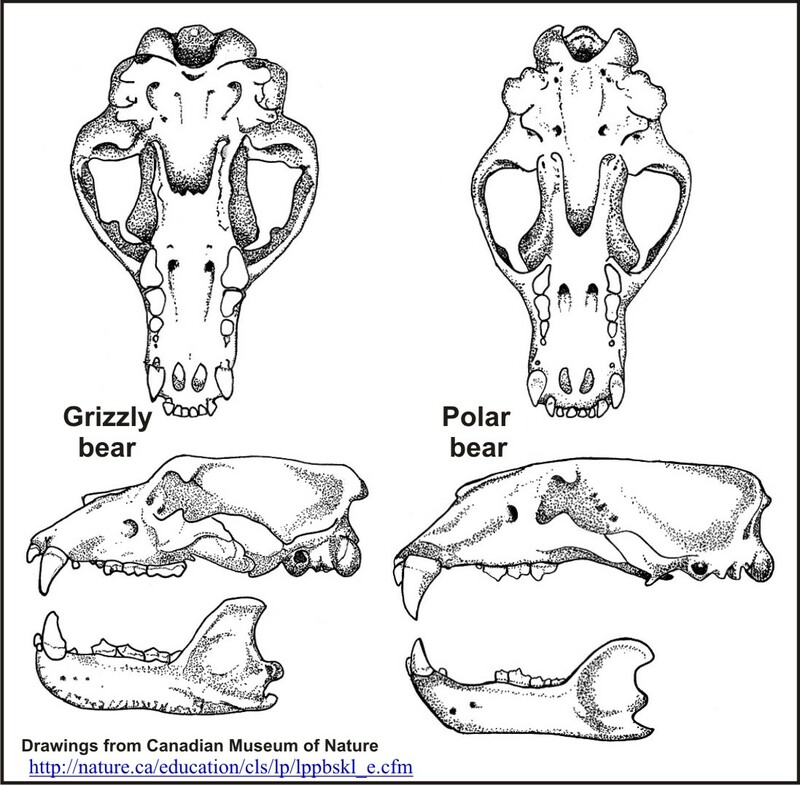 While it is true that polar bears – under certain circumstances – have successfully interbred with brown bears (aka ‘grizzlies,’ Ursus arctos)[see previous post on hybridization], there are many characteristics that distinguish each of these species as unique entities (see diagram below). Previous genetic studies (primarily using mitochondrial DNA) showed that some modern SE Alaska brown bears and ancient Irish brown bears were more similar to polar bears than they were to other brown bears (also discussed in this earlier post), leading some folks to question whether polar bears should be considered a distinct species. For example, as one Nature magazine editorial writer put it five years ago, “whether they [polar bears] actually constitute a species is up for debate.” (Marris 2007). I won’t debate the various definitions of what constitutes a species here. However, evolutionary biologist Ernst Mayr has repeated insisted (Mayr 1982:274; 1991:148) that occasional hybridization between closely related species, even if it produces offspring who are themselves capable of reproducing, does not negate their species status. Here is the abstract of the new Cronin and MacNeil paper. Polar bears (Ursus maritimus) and brown bears (Ursus arctos) are closely related species for which extensive mitochondrial and nuclear phylogenetic comparisons have been made. We used previously published genotype data for 8 microsatellite DNA loci from 930 brown bears in 19 populations and 473 polar bears in 16 populations to compare the population genetic relationships of extant populations of the species. Genetic distances (Nei standard distance = 1.157), the proportion of private alleles (52% of alleles are not shared by the species), and Bayesian cluster analysis are consistent with morphological and life-history characteristics that distinguish polar bears and brown bears as different species with little or no gene flow among extant populations. [my emphasis] Address correspondence to Matthew A. Cronin at macronin@alaska.edu. Bottom line: despite occasional hybridization, all evidence supports the designation of polar bears as distinct species. Send me a note via comments page if you would like a copy of the paper. Mayr, E. 1982. The Growth of Biological Thought: Diversity, Evolution and Inheritance. The Belknap Press of University of Harvard Press, Cambridge. Mayr, E. 1991. One Long Argument: Charles Darwin and the Genesis of Modern Evolutionary Thought. Harvard University Press, Cambridge, Mass. This entry was posted in Evolution, Hybridization and tagged brown bear evolution, Cronin, genetics, hybridization, MacNeil, Miller, polar bear evolution, taxonomy. Bookmark the permalink.